Have you ever made granola bars that were so good you couldn’t put them down until you ate the last one in the pan? Yea, these granola bars with date caramel are those granola bars. They are chewy, crunchy, salty-sweet, and very satisfying. I think it’s the combination of dates and nut butter that’s so addictive. I’ve said it in the past that I am the biggest nut butter addict. I get through an entire jar every 4 days. It’s kind of ridiculous. It doesn’t even matter what flavor it is. Almond, cashew, hazelnut, pecan, walnut – if they’re in the house, I’ll eat them. On days I feel like I’ve eaten too much but still find myself opening the fridge for another spoon, I ask my husband to find a good hiding place for the jars and swear not to tell me. Now, imagine a combination of rich, creamy nut butters, sweet caramel-y dates, and aromatic vanilla. Date caramel is so easy to make and extremely delicious. The first time I sampled date caramel at a farmer’s market in Vancouver a few years ago, I was hooked. Walking by the table, I instinctively took a small paper cup filled with the date caramel and walked on. I took one bite, turned around and walked back upstream to buy two jars of that goodness together with two boxes of Medjool dates. Since then, dates became a favorite sweetener in my kitchen. 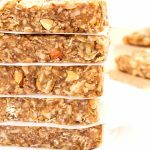 These Granola Bars with Date Caramel are quick, easy, and if you have nut butter or date addiction like me, you probably have all the ingredients on hand already. They are awesome for a snack, perfect for breakfast on the run, and will easy satisfy your dessert cravings. Creamy and smooth date caramel is all about having moist, sticky, soft dates. If your dates are dry and hard, they won’t blend as well and will require soaking in warm water first in order to soften them. One of the best dates you can use are Medjool dates. They are tender, juicy, sweet, and have a deep caramel-like flavor. When blitzed in a food processor, they quickly turn into a creamy caramel paste. I use this date caramel for many of my raw recipes, including these raw truffles, raw almond butter fudge, or raw chocolate chip cookie bars. it doesn’t matter what kind you use – smooth or crunchy, almond or peanut – as long as it’s fresh and nuts are the only ingredient. 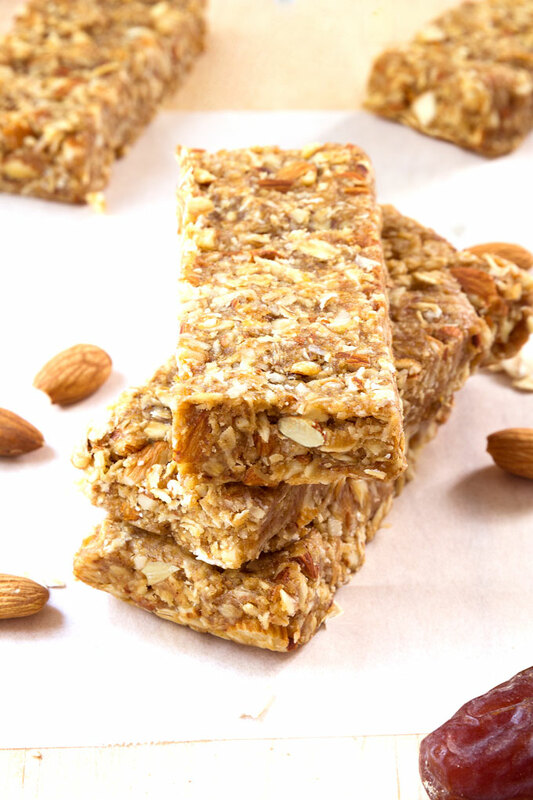 Almond butter has been my go-to choice for these granola bars with date caramel. What makes this jumble of ingredients more than muesli is the addition of sticky stuff to bind them together into bars of deliciousness. You can use maple syrup, honey, or brown rice syrup. They all work great. If you’re going for the best flavor, I recommend maple syrup. If you want all the ingredients to become inseparable, brown rice syrup is where it’s at. Honey is a mix of both worlds – it has a great flavor and is sticky enough (but it’s not vegan). Finally, in all baked goods, salt brings out and brightens nuanced flavors. Every baking recipe I’ve ever worked with requires at least a pinch of salt. Even though it’s only a pinch, don’t forget to add it and make sure it’s the exact measurement. Not enough salt leaves desserts flat, and too much leaves them, well, unintentionally salty. To achieve that creamy, smooth, caramel-like consistency using dates, you’ll need to use a food processor. I’ve tried making date caramel in my Vitamix, but found that it’s not quite as easy. While you can use a high-speed blender to get the job done, blenders just require a little more time, effort and a bit more water to get things going. The easiest way to handle the sticky nut butter is to heat it up together with the liquid sweetener. It should be just loose and liquid-y enough to pour. The liquid-y nut butter-sweetener mixture will give the granola a nice even coverage. After a few tries, I’ve found that it’s really important to press the granola mixture into the pan. The harder and longer you press, the less chance you’ll end up with granola instead of granola bars. If the granola mixture sticks to your hands, wet your hands or use a bit of coconut oil. You can also top the the granola bars with parchment paper and press away. I’m one of those people who like their granola bars raw. I keep these granola bars with date caramel in the refrigerator (or the freezer) and take them out when I want to eat them. Right out of the refrigerator, the bars are hard since they are cold. They’re also little chewier and softer than when you bake them. However, if I know that I’ll be adventuring with these bars in warm weather, I usually bake them because they hold their shape a little better. These Granola Bars with Date Caramel are healthy, chewy, crunchy, salty-sweet, and very satisfying. They are awesome for a snack, perfect for breakfast on the run, and will easy satisfy your dessert cravings. Line an 8" x 8" (20 cm x 20 cm) baking dish with parchment paper (this step is optional, but the parchment paper does help with removing the bars from the baking dish). Place the dates into a food processor and pulse them until a "dough" like consistency forms. Add all the ingredients into a bowl and mix to combine. The rolled oats should be completely coated and start to stick together in clumps. Once thoroughly mixed, transfer the mixture to the parchment-lined baking dish. Use wet or lightly oiled hands to firmly press the mixture into the pan. 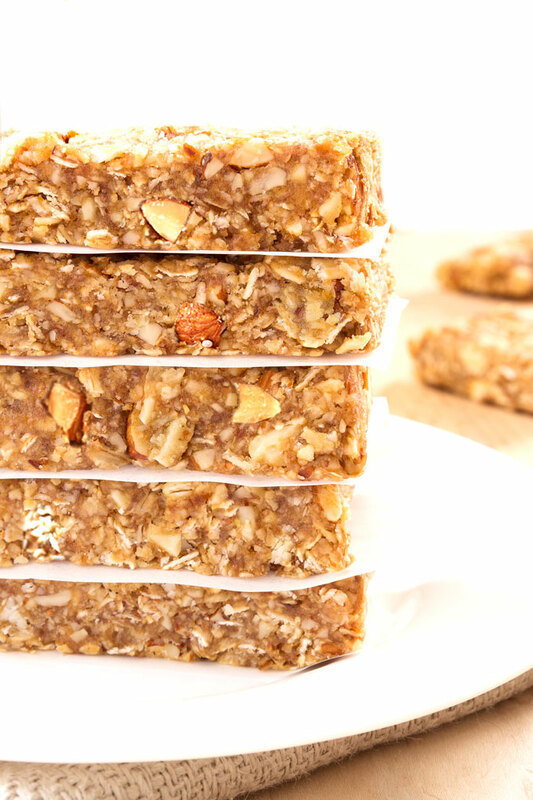 Raw version: let the bars firm up in fridge or freezer for 15-20 minutes. Then remove the bars from the pan and cut them into 8-10 even bars. Baked version: preheat the oven to 325°F (165°C) with a rack in the middle of the oven. 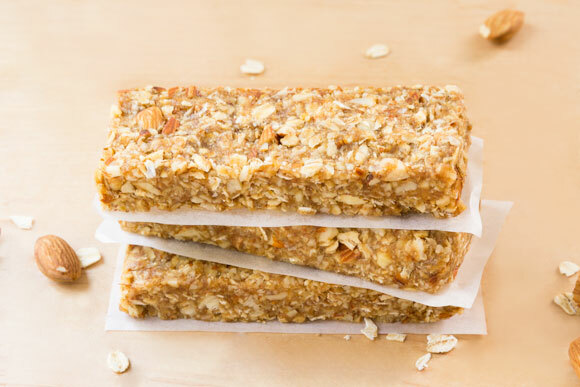 Bake the bars for 20-25 minutes for chewy granola bars or 25-30 minutes for crunchy bars. As soon as you remove the bars from the oven, press them down again with the back of a lightly oiled spatula. (This will give you more compacted granola bars.) Let the bars cool completely in the pan. Then remove the bars from the pan and cut them into 8-10 even bars. Store leftover bars covered in the refrigerator for 1 week. For longer term storage, freeze in an airtight container for 1-2 months. This recipe has been adapted from Minimalist Baker. I made them the other day with honey and peanut butter. I also added some cacao nibs and dipped one side in chocolate (using your recipe for home made chocolate with coconut sugar). They were do delicious I couldn’t stop at just one! Thank God I made them smaller! Next time I’ll try hazelnut butter and hazelnuts instead of almonds. Thank you so much for the delicious recipe Petra! Yay – You just made my day, Ioanna! I am so happy you enjoyed the bars. Thank you so much for sharing your modifications and feedback! Update: I made them with hazelnut butter and chopped hazelnuts. I added some cacao nibs but no chocolate this time to save me some calories. I can’t tell you how delicious they tasted! Next try will be with peanuts and peanut butter, then sunflower seeds and sunflower butter and eventually even dried coconut and coconut butter. I’m so excited! Those bars have become my favourite sweet and healthy snack! I can’t send my kids to school with nuts so I sub the almond butter with tahini and the nuts with sunflower seeds. They turned out great! thanks for the recipe! Hi Petra, I’m going to try this recipe tomorrow, if i want to use agave instead of maple syrup, do you think it would stick enough for both raw or bake versions? I stored these in an airtight container in the refrigerator, will they last longer than a week in there ? This recipe is great. I added a drop or 2 of water while blending the dates, added a spoonful more or peanut butter and drizzled melted chocolate over them. Made and gave them all to my fiancee, and he loved them.